I took the kids to the mall last night. This wasn’t just another little visit to the “mall”. It was exploring the new Westfield Southcenter mall in Tukwilla. This is a mall that I’ve been to many times from as far back as the early 70’s. Back when they actually had a grocery store inside and a Payless. They actually had a full size furniture store in that mall. I actually worked there for about a year in a Mexican Restaurant. The new renovations are amazing. Cool stores, food court, & theater. The mall is so busy that you can hardly find a parking spot. I can only imagine what that place is going to be like at Christmas? Very cool environment. Worth the visit. Funny thing is this, all I’ve got to do to be a cool dad is load up my kids and their friends and take them to the mall for the night. Had lots of fun. When was the last time you had fun going to the mall? It’s cool to live in Seattle because we didn’t let the NBA and Clay Bennett hold us hostage for another stadium tax. Here’s the way I see it. The Sonics didn’t leave….some greedy greasy business guy came in…bought a franchise (with full intent to move it) and moved it to OKC. The Sonics that I loved will alwasy be in Seattle and if they never resurrect…the RIP. I was not a season ticket holder so I’m just as much to blame for them leaving as everyone else. Here’s my opinion. I think the NBA is a JOKE! I’m not sure we should raid another city of their team…nor should we put anything into an expansion team. Again…Stern is sitting back and saying, ” pay up and build a new stadium and then we’ll consider giving you another team”. Give me a break. We can not stand for any more taxes. Side note….my buddy Howard Schultz, “Mr. Starbucks” doesn’t get off the hook that easy. He should have never sold to Clay. Please tell me he’s not the only person in Seattle that didn’t see this coming? Yet…because I love my Starbucks….I’m quick to forgive uncle Howard. Stop the bleeding. Besides…with the Sounders(MLS) coming back…and playing at QWest…..I think we have a new sport in town that will take place of basketball. I love the fact that QWest will be getting more playing time. So, good riddens to the group of people and ownership who just moved to OKC. 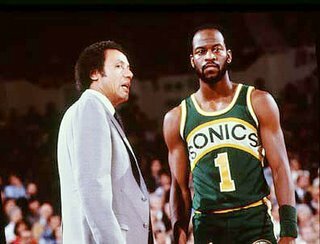 The are not and never will be the Sonics. Welcome back Sounders. I think I might just get season tickets for the MLS. Makes me proud to live in Seattle. Why are you proud of your city?